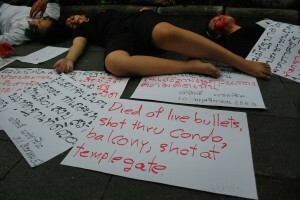 Prime Minister Thaksin Shinawatra, while divesting the Government and security forces of responsibility for the deaths and destruction wrought during the March-May 2010 anti-Government redshirt protests. 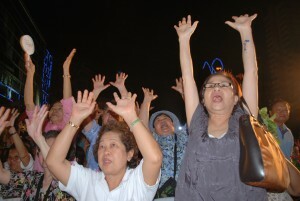 “If you want to get rid of the poison that is Thaksin, then you should vote for us to get more than 250 seats”, said outgoing Prime Minister Abhisit Vejajjiva, closing-off a five hour rally held at the same Rajaprasong intersection where the redshirts blockaded for much of their 2 month rally last year. Thaksin Shinawatra won successive elections as head of the Thai Rak Thai party in the early 2000s, but some Thais viewed his governing style as mercurial and overly-authoritarian, with whispers that his popularity, particularly in rural areas in the country’s north and northeast, posed an implicit challenge to the country’s monarchy. He was ousted in a September 2006 coup, and though the party backed by him from abroad formed a Government after a 2007 election, this entity was in turn removed from office after a combination of yellowshirt street protests and court decisions paved the way for coalition partners to defect to the Democrat side. Last night’s crowd of perhaps 6-7,000 howled and gesticulated with derision when clips of Thaksin Shinawatra were shown, interspersed with images of redshirts leaders and scenes of violence from the 2010 rally, on the two videoscreens to the right of a stage bedecked in Thailand’s national flag. The Democrats accused Thaksin of hindering reconciliation in Thailand, and say that a Peau Thai government would include senior redshirts, some of whom the Democrats have accused of terrorism. 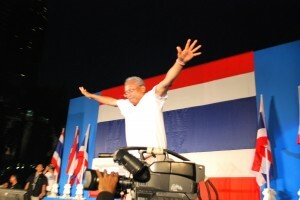 The rally opened with Abhisit’s deputy PM, Suthep Thaugsuban, giving an audio-visual presentation during which he outlined what his party deems as the truth behind the events between March 12 and May 19 2010, when the Thai army launched what turned out to be a bloody crackdown on the remaining redshirts at Rajaprasong and the surrounding streets. Controversially, Mr Suthep claimed that “No-one died at Rajaprasong on May 19 last year”, and accused redshirt leader Jatuphon Prompan of complicity in the shooting of ‘Seh Daeng’, the nom de guerre for a Thai Army officer who was aligned with the redshirts, who was assassinated by an unknown sniper while talking to foreign media at the rally site. May 19 2010. While formal identification of the gunmen has not taken place, redshirts and human rights groups have accused the army of killing medics and protestors who were seeking sanctuary in the Buddhist temple, six hundred meters from the main rally area. 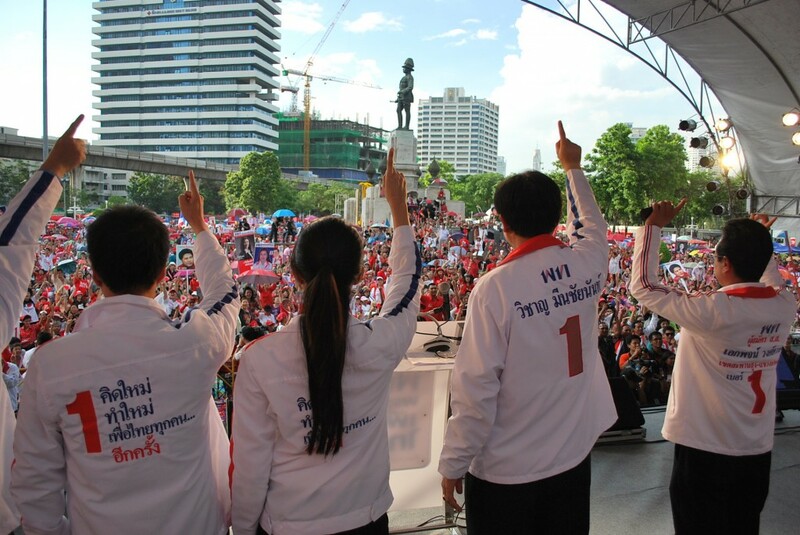 The location of the rally was deemed as a provocation by redshirts and some opposition politicians, though Peau Thai asked that supporters stay away from the event. Prior to the event, there were conspiratorial whispers that some form of orchestrated violence or confrontation might take place. Speaking at the Rajaprasong intersection earlier on Thursday, Thammasat University’s Prof. Worapol Prommikabutr said that “if there are redshirts at the rally later tonight, you can be sure that they are not ‘real’ redshirts, but sent there by others to stir fake trouble and discredit the opposition”. 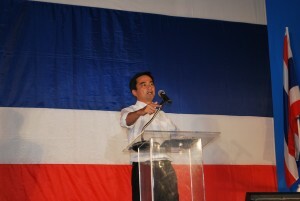 Prime Minister Abhisit Vejajjiva’s party is trailing the redshirt-aligned Peau Thai (For Thais) party in opinion polls. Thaksin’s youngest sister Yingluck Shinawatra is the opposition party’s candidate for Prime Minister, highlighting the influence of Thaksin over the party, which if the polls are to be believed, has not yet turned voters away from the opposition. Voters in the northern city of Udon Thani seem set to vote en masse for Peua Thai, when I spoke with people there earlier this week. In contrast to Bangkok and other towns further south, election posters are thin on the ground in Udon. “This is redshirt country”, said Jay, an American citizen born in Thailand, but back home for a summer visit. He surmised that “I guess there is no need for Puea Thai to compete here, and the other parties maybe see there is no point spending money campaigning here”. 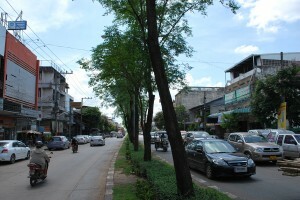 Outside the city, ‘redshirt villages’ have been set up, highlighting the regional divide in Thai politics and society, though recent polls hint that Peau Thai may be cutting into the Democrats traditional dominance in the capital, and last night’s rally was in part at least an attempt to counter-campaign, with speakers rhetoric infused with concepts such as ‘reclaiming’ Rajaprasong, a landmark intersection close to some of Asia’s largest shopping centres and the city’s high-end hotels. 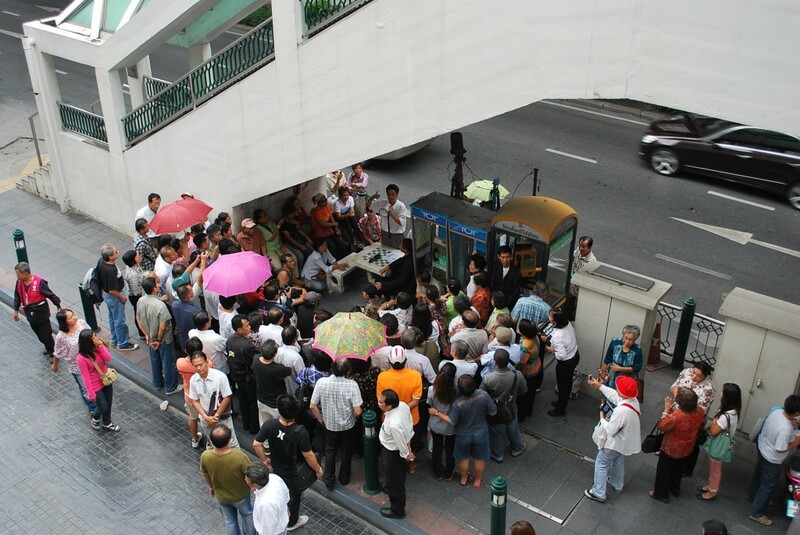 Today Abhisit and other senior Democrats will campaign close to Rajaprasong, meeting voters in Silom, the main finance and banking district, which was another site for violent confrontation and unexplained grenade attacks during the 2010 redshirt protests.